a gallon at southfishing.com Story & Photos By Joe Richard. Macuto was founded in August 1740 at Guaicamacuto (which translates roughly to "basket of thorns"), once an indigenous village. Unused beaches may be a sign of dangerous undercurrents. The El Placer Bank home to a year-round population of sailfish and blue marlin, as well as dolphin, Wahoo, and yellow fin tuna. World-class anglers have discovered that "seasons" mean little in these fertile waters - both bait and game fish abound all year long. In Carabelleda you can connect with experienced crews, well equipped boats, and top-of-the-line tackle. Venezuelan captains have been winning awards with impressive results at competitions for many years. Museum Armando Reverón: Located in Macuto. In 1918 he met his muse and wife at the Carnival. In 1921 the the artist began construction on this museum tower, which symbolized a transformation of his artistic concepts in which he rejected being judged in relation to European art and sought a deeper perception of nature under the direct light of the sun. His chromatic values stirred the critic Alfredo Boulton to call this “White Time” His work is very valuable and is found in many major museums, with a large collection in Museo de Arte Contemporáneo. His last days were in a sanitarium. This museum was seriously affected by the mudslides and may not yet be open. The coastal zone is called El Litoral central. It's 30 minutes away from Caracas and coming along nicely in recovering from the infamous 1999 mudslides, with new beaches and long-time favorite restaurants beginning to bustle. Those worried about traffic delays and nighttime crime choose this zone for their overnight stay when making connecting flights through the coast side International Airport in Maiquetia. The best known towns include, from west to east, Catia La Mar, Maiquetía, La Guaira, Macuto, Caraballeda and Naiguatá. Most head east on La Playa and aim for the beaches and vendors waiting for them between Macuto and Carabealleda. With a car, you can discover the spectacular undeveloped North Central Coast of Vargas State. Beaches stretch as far as the eye can see, neighbored by clear lagoons surrounded by dense vegetation. The crashing surf on stunning rock formations and virtually no signs of development is the escape many long for on their vacations. The area also supports an impressive schedule of afro-caribbean cultural events. The Afro-Venezuelan music and penchant for joy in the present is well-represented in the El Littoral. The compelling rhythm of the drums and colorful costumes make it possible for visitors to share in the folkloric traditions. The verdant mountain chain of El Avila National Park acts as a spectacular backdrop, and the always inviting Caribbean sea make this a sure bet as the zone, the newest state in Venezuela, rethinks the opportunities of the extra real estate and new beaches the mudslides created --the beaches east of Los Caracas were substantially enlarged by the mudslides. Recovery has been slow. The state of Vargas was only created in 1997, when it was separated from "Great Caracas". The state is divided in eleven different municipalities; Caraballeda, Carayaca, Carlos Soublette, Caruao, Catia La Mar, El Junco, La Guaira (the main parish), Macuto, Maiquetía, Naiguatá and Raul Leoni. La Guaira is the capital of the Venezuelan state of Vargas, and the 500 year old country's historic port of entry. It is located next to Maiquetia, location of the airport which sees 90% of the international air traffic in Venezuela and is notorious for mishaps. A walk around the central coast should begin at La Guaira, which was founded in 1577 as an outlet for Caracas, 30 km to the southeast. The intact historic town rises up steep hill to colonial forts. Castillo San Carlos - built in 1979 - is not visible from the town, but offers a popular panoramic view of the town and bay. Casa Guipuzcoana is the largest civil structure of the colonial era on the coastal Av Soublette road, named for local native Carlos Soublette who was Venezuela's 3rd president. It was originally built by the royal trading monopoly run by Basques before becoming a customs house. Restored in the 1970's, it can only be seen during office hours. The Basque region of Spain still enjoys close ties with Venezuela. In their day, they were also in charge of enforcing the monopoly against the robust trade of the Orinoco river to Ciudad Bolivar, then known as Angostura. Macuto is widely regarded as the best of the Caribbean coastal towns near the Caracas airport. It's long history as the favored among the urbanite Caracenos has given it a pleasing resort layout, a broad assortment of accommodations and strong infrastructure. Macuto is some 10km from the airport and the adjoining state capital of La Guaira. Since Macuto is served by public buses and the "por Puesto" private jitneys from Caracas, the quiet weekday beaches will become crowed with many Caracenos on weekends. Sidewalk restaurants, ice-cream shops and horses for hire are popular. The seaside promenade is a nice place for a walk or jog. A few museums are also nearby for the rainy days. Today the Olé Caribe takes the place of the 1928 Hotel Miramar which was the first luxury 5-star hotel built on the coast in Venezuela. Macuto was founded in 1740, so it has a long tradition as a getaway. In 1888, Venezuelan President Joaquin Crespo built a mansion here; it is called La Guzmania, and it can still be visited, although it is now a college. Marcuto has the coast's best dining and there is a full service marina available for yachts and sailboats. By 2004 Macuto had recovered from the mudslides and its two beaches below the waterside walkway of malecón La Paloma can quite packed on weekends. The two 100 ms X 15 ms beaches have breakwaters which eliminate most wave action. PARQUE COSTERO PASEO DEL MAR Heading east are several beaches restored in 2004 that are very popular since they are just off the highway, with full services (and little privacy). Traditionally the most upscale of the Littoral towns, but among those most hurt by the '99 mudslides. Founded in 1567 under the name of Our Lady of Caraballeda by the Spanish conqueror Diego de Lozada, who also founded Caracas. The beaches of Playa Lido and Caribito and Playa Los Coccos by the Gran Caribe Hotel are beaches with some services. In 2001, the Macuto Sheraton and all its 543 rooms closed because the Sheraton management group chose to pull out. Unlike other hotels in the area it was undamaged during the December 1999 floods and mudslides that devastated much of the region and forever changed the beach story. The adjacent 290 room Gran Caribe (formerly the Melia) also remains closed, leaving the 5-star hotel market to the all new Hotel Ole Caribe. The Sheraton Beach is very popular, as its location creates easy waves ideal for children. The many coconut palms and numerous churuatas offer pleasant shade. There is no end to beach vendors offering meals, drinks and bathing suits. In spite of the lack of maintenance and security, it is a popular place on weekends and holidays. The yachts and deep sea fishing crowd have continued to favor the Marina. The coast has some of the world's best deep-sea fishing; just a half hour from shore are the underwater mountains [16km long and 6km wide] that are known as the The El Placer Bank and they provide ideal baitfish habitat just a brief 30 to 40-minute run from where the boats are docked.. The Carabella Marina is a boat charter center for exploring these waters as well as taking trips to Los Roques. In Naiguatá, many come to Los Angeles Beach and arguably Venezuela's #1 surf beach, the Naiguatá bath. There are three beaches in form of average moon of 300 ms X 25 ms. The sand is gray, and the waves smooth to moderate thanks to the protection of a series of breakwaters. Some boats of anchored fishermen are left on the beaches. Plenty of vendors rent awnings and chairs. Naiquatá has a great variety of restaurants and bakeries. On weekends these beaches are extremely crowded despite the minimal maintenance. Los Angeles Beach Following the coastal highway east the city of Naiguatá and before the club Camurí Grande, is an immense beach of 800 ms X 150ms. Playa Los Angeles is straight, with dark sand and very smooth surge. It lacks cleaning and the shade is little, a good reason for a sombrilla. There are several restaurants, and secure parking that costs Bs. 2.500 per day. The many people who arrive in public transport prefer beaches between Macuto and Naiguatá because of the shorter distance and frequency of service. They are also just day users. Those with their own vehicle can take advantage of these most paradisiacal isolated beaches on the Eastern end of the Central Coast between Caracas and Chuspa. There are small posadas to take advantage of here. There are two routes of access to this zone: crossing mountains from Caracas to Maiquetía and soon towards the east; or from Higuerote, towards the west via Chuspa-Maiquetía. Pantaleta beach Passing Camurí Grande is Pantaleta beach, at 500 ms X 30 ms. This beach is a good example of the change to the coast after the 1999 floods; before the beach was on the brink of the highway and today it is about a 100 meters further out. The authorities completely renewed the beach in 2004, adding restaurants spaces, showers, toilets, a children's play area and life-guards in high season. Before, it was well-known as a famous point of contact for surfers and body boarder; now the atmosphere is more family oriented. Although cleaning is weak, this beach has been highly recommend for its fabulous waves and pleasant atmosphere. PLAYA CARE Located 15 minutes northeast of Naiguatá, this small and calm beach (150 ms X 15 ms) has moderate waves and a gradual increase in depth. Posada Care, located on the beach border, offers drinks and meals. There are showers and new toilets. The beach lacks vegetation but offers calm privacy. PLAYA ANARE [30 ms by 350 ms] On the highway 4km further from Playa Care is the town of Anare. The beach is not seen from the town, but leaving form the direction of Caracas it is possible to enjoy the vista: this beautiful white sand expanse bathed by blue waters, a hidden treasure of the coast of Vargas. The waves are moderate, but the wind blows with force and regularity. The operators of the Villa Anare posada [Malecón de Anare- Vía Los Caracas, Anare] also have a restaurant and lodging. Small coconut palms soon will offer shade, which is currently lacking. It is a pretty, calm and little known place. A great tourist complex was constructed at the end of the asphalted part of the coastal highway in 1955 with the aim of offering Venezuelan workers a place to vacation with their families. Beach Caracas is located on the left-hand side of the town's entrance. This small beach (50 ms X 5 ms), with white sands and great waves, has an extensive green meadow on its right side with many trees that give shade and allow folks to hang their hammocks. There are spectacular views and untiring surfers that have found a their paradise here. Since the surge and the current are specially strong, in it is necessary to be a good swimmer in order to bathe here. There is secure parking but little commerce. East of Los Caracas, the road travels alongside a spectacular coastline studded with overhanging cliffs, breakwaters, small villages and public beaches. You need a 4 x4 in the rainy season. The colorful and traditional town of Caruao is known for its goat cheese and vistas. 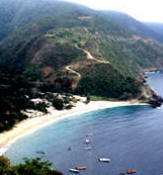 The Beach of Caruao is located on the border of the main highway that crosses the town, where there is a pleasant levee. The white sands extend on a 300M x 30Ms beach which is very popular with the locals, and which has baths and showers maintained by the state. The last town on the Eastern coastal highway of the State of Vargas, Chuspa is probably the most developed tourist spot in this largely undeveloped zone. The town enjoys a spectacular river mouth and many fishermen. During the high season, there is usually a party to be found along the levee that borders the beach. In center of this levee is a the bust of Francisco Fajardo who founded the town in 1555. The marina has skippers who can take visitors to isolated Caribbean beaches and diving site. Chuspa offers many lodging and dining options. The beaches west of the airport, beginning with Catia Las Mar, have never been as popular or well maintained as those to the east. While they were relatively unharmed by the mudslides, the area is plagued by pollution and insecurity. Still this is the beach area closest to the international airport and it is not without its attractions, including airport pickup and cheap hotel rates. The Marina Grande club opens a sector of its beach to the public, with fine sand and crystal clear waters. Some of the other beaches are Playa Grande, Balneario Municipal de Catia and Puerto Viejo. PLAYA CATAMARE Catamare beach, small semiround bay (100 ms X 20 ms), of dark sand and low surge, since it is protected by two artificial giant stone breakwaters. It has several kiosks, loncherías, venders awnings and chairs, and some parking. This pleasant urban beach appears better kept and calmer than other beaches in the seaside town. Despite the absence of baths and greenery, its proximity to Catia La Mar makes the beach a good option. GETTING THERE: Follows the coastal highway West, passing the Military Club on the right. Near kilometer 4, the road turn back to the coast for 1 km in the direction of the electrical plant Ricardo Zuloaga. Before arriving, from the high mountain highway, it is possible to enjoy the view of one of the most extraordinary bays of the country. This Caribbean beach unfolds on 150 ms x 30 ms. The white sand beach has great palms that offer abundant shade, and its dark sea goes deep quickly. The fishermen use the left side of Chichiriviche river, which makes the waters dark with mud in the rainy season. It is an urban beach located along the town with many services including lodging. One of the best place for visitors in the state Vargas. This is a popular place for scuba diving because of the excellent underwater banks. GETTING THERE: Chichiriviche de la Costa, about an hour's drive further West from Catia La Mar. There's a better known beach town of the same name in the State of Falcon, so its best to ad the "de la Costa" to avoid confusion. Public transport is available from Plaza Venezuela and Parque Central. 20 min. from Caracas and 5 min. from Aeropuerto Internacional Simón Bolívar. A taxi from the airport to Macuto runs about US $25. hotelolecaribe.com Hotel Ole Caribe in Macuto (58-212) 620.2000 / Fax: (58-212) 620.2060 5 star - English spoken- airport pickup. Close to the marina. A bit far from the beach but spectacular grounds and ocean views more than make up. "By far the most comfortable option on the coast near the airport. A comfortable and well-maintained luxury hotel, the Olé Caribe is filling the void left by the closings of the nearby Sheraton and Meliá properties. The rooms are all clean, bright, and well maintained, and feature a handful of amenities to be expected in this class. Most of the rooms have ocean views. ....Located 15-minutes from the airport, this is becoming the prime choice of local and international tour operators who are increasingly having their guests bypass Caracas." Av. La Playa cruce con Calle 3, Urbanización Álamo, Macuto. A traditional landmark in the Central Coast of Venezuela. Room Service, swimming pool, 24 hours service Cafeteria, Conference Center, Free Parking rooms include air conditioned, color TV, hot water Near Caracas (30 min.) and Maiquetia's International Airport (10 min.). Totally remodeled. Taxi Service Airport-Hotel busy waterfront seaside restaurant, pool AC 15 minutes from airport, 10 minutes from shopping mall and discotheques. Terrace with sea and mountain view. Hotel Santiago has always stood out for its colonial style, as well as its famous restaurant which serves Cuban specialties. It has an excellent atmosphere, and is located in the best area of the Litoral Central. "relatively inexpensive $60 US for a family room for 4 and had a good inexpensive restaurant and a swimming pool on the roof. Room pretty basic but clean and ok for a night. It was 25 min taxi ride (lots of traffic) from the airport at 4pm but only 5 - 10 mins at 6 am next day. Cost $25 US each way. In the wake of the slow clean up following the 1999 mudslides in 2001 the Macuto Sheraton and all its 543 rooms closed as did the adjacent 290 room Gran Caribe. Five years later there are still no announced plans regarding reopening. Airport transfers - Bs.10.000 each way 5 minutes from Caracas airport. "They weren't waiting for us at the airport as agreed. I had to call the hotel and they arrived 30 min after. When we arrived at the hotel, four guys with guns were robbing the hotel ... Sept 2006. "best place in town to eat. We asked for a total of 3 airport transfers, and each time it worked perfectly, they were very reliable. " "I would highly recommend this hotel if someone is looking for a overnight stay. " "Food is outrageously expensive and the quality poor. Rooms are big but not cheap." we stayed at the IL Prezzano Hotel and had two wonderful dinners at the Posada Restaurant. Sabatino Gismondi, proprietor, had a driver pick us up from the domestic airport and a return trip to the International upon our departure. Our room was, very clean, and we were very safe. We spent the following day at a local beach, walking to and from our hotel. Located just east of La Guaira , this recently refurbished marina has friendly staff and 24 hour security. Clearance must first be completed at the commercial port of La Guaira. The fish of your life is just a hook-set away off Venezuela's north coast. The plankton-rich Southern Caribbean waters off the north coast of Venezuela drift west and flow over the natural ridge named El Placer (meaning "the pleasure"). It is a unique natural phenomena not to be found many places in the world today. The El Placer bank in La Guaira holds one of the world's most impressive billfish concentrations. This underwater fishing paradise rises nearly 50 fathoms from a 140-plus fathoms depth of the surrounding bottom. About 4 miles wide and 14 miles long, La Guaira Bank is just a brief 30 to 40-minute run from where the boats are docked at the marina. venezuela-fishing.info/fishing/Venezuela-fishing-reports.htm The SeaFighter is a great boat and the captain and crew were just outstanding. This was the trip of a lifetime. We raised 6 marlin and boated a nice white marlin. We brought back to shore 8 Dorado, between 25 and 45 pounds. The Hotel Santiago, although not five stars, was very accommodating and the food was some of the best. Tyler, the driver, was always there to meet us in the morning and when we retuned from the boat. explore-yachts.com/charter/deepsea-fishingen.htm The abundance of species such as Blue Marlin, White Marlin, Sail Fish, Wahoo, Tuna, Barracuda, make of this area a true paradise. Fishing zones are only a 30 minutes off shore cruising at normal speed. It has a rich cultural and folkloric tradition, beginning with the New Year in January when most of the population of 15,000 greets the boat carrying the Sardine of Naiguata. El Día de los Reyes, or the day of 3 kings, is celebrated on the 7th of January. The coming of the magical kings happens as everyone prepares for the Carnaval coming soon thereafter in February. Particularly renowned for the Naiguata Carnival is Ash Wednesday, when the town performs the “Burial of the Sardine” in grand fashion, combining dance, theatrical disguises, music, representations and poetry, marking the conclusion of the Carnaval season. This Carnaval Celebration peaks on the two weekends on either side of Ash Wednesay. June is the month when Naiguta's street celebrations of Corpus Christi are distinguished for their colorful lively devil dancers made up in red and gold. The observance, set in relation to Easter Sunday, usually occurs in June. Unlike celebrations in Chuao and San Francisco de Yare, women are allowed to portray devel dancers in Naiguata. Symbolically, the drama plays out the preference of the higher power for good over evil, because the devil never sleeps. On the Wednesday before Corpus Christi the devils are called by the ringing of bells and three beats on a metal drum called a Caja. They descend upon the town and run amok before falling upon their knees to pray in front of the church. From the heights of El Ávila we can contemplate the winding coastline of the Caribbean fringed by royal palm trees. Caracas has two cable car routes to offer you: Maripérez-El Avila and Maripérez-Macuto to the top of Cerro El Avila. Try taking the coast side to the top of the mountain. "There is a lively crowd of people in Macuto, of all ages and states, fit for the boulavardier or rocker alike. You can see an inshore fishermen, barefoot, bronzed, traipse his catch in the night direct from his boat drawn up on the sandy beach in among the well-dressed diners sitting at the outside tables, and hardly help but watch overwrought Latin lovers beating up their lady loves with an intensity hardly dreamed of in cooler climes." The town of Catia La Mar is not Caraballeda. It’s totally different. It’s not as close to the marina as in Caraballeda. You can still get just about every thing you need. There are several grocery stores with all the basic amenities. There are a great variety of restaurants for those of you that enjoy going out to eat. The food and atmosphere is comparable to the Bodegon in Caraballeda. There is also a very popular nightclub were people from Caracas come down to party on the weekends. This club has everything you need including music, booze and some of the most beautiful women that Venezuela has to offer.... Catimar a.k.a. “Pinkie” because of the bright hot pink color of the building. The beaches west of the airport were largely unaffected by the mudslides but they have never been popular. The beaches east of Las Caracas have been substantially enlarged and are slowly coming back into their glory. These easterm Vargas State beaches of Osma, Oritapo, Todasana, La Sabana, Caruao and Chuspa could become prime recreational destinations with some infrastructure help from the governmental authorities.